Tagline- Watch Out! They’ve Got to Clean Up the Worst Crime District in the World. But That’s No Problem. They’re the Worst Police Force in the Universe. 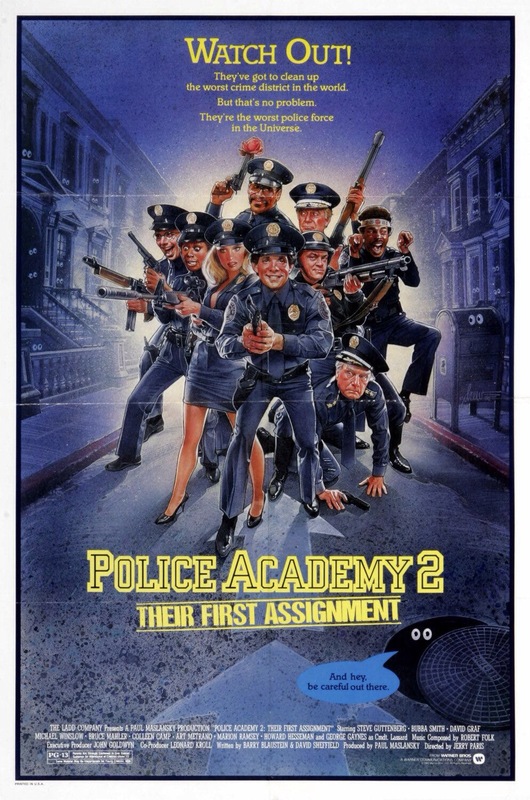 Released in 1985 Police Academy 2 was rushed into production and came out just little over a year after the original film. The first 6 were all released within a year of each with some not even being a full year, but I think WB was better prepared, but in my opinion Police Academy 2 feels very rushed and could have used a little more time. Most of the core of the cast returns with the exception of Leslie Easterbrook and G.W. Bailey (though he does have an uncredited cameo). While I don’t think Police Academy 2 was a bad film I personally would rate among the bottom of the series. The 6th film was quite poor with the 7th being the absolute worst and while Police Academy 2 is by far better than those two I still felt it was an inferior sequel to a surprisingly very funny original film. With crime rates high members of the police academy are sent in to help fight crime while Lt. Mauser (Metrano) plots to take over being Captain. The screenplay by Barry Blaustein & David Sheffield has its moments where it’s quite funny, but for me it just felt very rushed and could have used a touch up or two. Some of the issues I have is the core of the cast just doesn’t have the same impact here and the reason they however work well was due to the actors. With the returning characters and newly added there were just too many and had the script been polished up I don’t think it would have been an issue. While the script isn’t bad I just didn’t find it as funny as it had potential to be, but there were some truly funny scenes such when Mauser is taking a shower and Mahoney (Guttenberg) switches his shampoo with crazy glue. As director Jerry Paris does a fairly decent job, but I found the pacing to be a little sluggish in spots and despite running at only 87-minutes I did find the film a little overly long. The comedic bits don’t work as well as the original, but Paris does deliver some really funny scenes, but as a whole it just felt a little forced. The cast is very much the bright spot and make the film funnier than it should have been, but the lack of George Gaynes as Lassard does hinder the film as he’s only in a couple of minutes of the film. But for me the biggest loss was G.W. Bailey as Lt. Harris. He was replaced by Art Metrano who was terrific as Lt. Mauser, but Harris was my favorite character in the series and I personally felt his loss hindered the film. Like I said I liked Art Metrano as he’s very funny and basically he’s playing Harris. Metrano would again return for the 3rd film before G.W. Bailey would return for the 4th film and returned for the rest of the series. Overall Police Academy 2 is a decent entry, but in my opinion one of the weaker ones of the series the whole production just felt a little rushed and some comedic bits work, but more often than not it falls a little flat. The cast however is game and helps make a bit more out of the film. The original film was the only one R-rated and this would be PG-13 and the rest were PG.